For other uses, see Gunpowder (disambiguation). Gunpowder, also known as black powder to distinguish it from modern smokeless powder, is the earliest known chemical explosive. It consists of a mixture of sulfur (S), charcoal (C), and potassium nitrate (saltpeter, KNO3). The sulfur and charcoal act as fuels while the saltpeter is an oxidizer. Because of its incendiary properties and the amount of heat and gas volume that it generates, gunpowder has been widely used as a propellant in firearms, artillery, rockets, and fireworks, and as a blasting powder in quarrying, mining, and road building. Gunpowder was invented in 9th-century China and spread throughout most parts of Eurasia by the end of the 13th century. Originally developed by the Taoists for medicinal purposes, gunpowder was first used for warfare about 1000 AD. Gunpowder is classified as a low explosive because of its relatively slow decomposition rate and consequently low brisance. Low explosives deflagrate (i.e., burn) at subsonic speeds, whereas high explosives detonate, producing a supersonic wave. Ignition of gunpowder packed behind a projectile generates enough pressure to force the shot from the muzzle at high speed, but usually not enough force to rupture the gun barrel. Gunpowder thus makes a good propellant, but is less suitable for shattering rock or fortifications with its low-yield explosive power. However, by transferring enough energy (from the burning gunpowder to the mass of the cannonball, and then from the cannonball to the opposing fortifications by way of the impacting ammunition) eventually a bombardier may wear down an opponent's fortified defenses. Gunpowder was widely used to fill fused artillery shells (and used in mining and civil engineering projects) until the second half of the 19th century, when the first high explosives were put into use. Gunpowder is no longer used in modern weapons, nor is it used for industrial purposes, due to its relatively inefficient cost compared to newer alternatives such as dynamite and ammonium nitrate/fuel oil. Today gunpowder firearms are limited primarily to hunting, target shooting, and bulletless historical reenactments. Based on a 9th-century Taoist text, the invention of gunpowder by Chinese alchemists was likely an accidental byproduct from experiments seeking to create the elixir of life. This experimental medicine origin of gunpowder is reflected in its Chinese name huoyao, which means "fire medicine". The first military applications of gunpowder were developed around 1000 AD. The earliest chemical formula for gunpowder appeared in the 11th century Song dynasty text, Wujing Zongyao, however gunpowder had already been used for fire arrows since at least the 10th century. In the following centuries various gunpowder weapons such as bombs, fire lances, and the gun appeared in China. Saltpeter was known to the Chinese by the mid-1st century AD and was primarily produced in the provinces of Sichuan, Shanxi, and Shandong. There is strong evidence of the use of saltpeter and sulfur in various medicinal combinations. A Chinese alchemical text dated 492 noted saltpeter burnt with a purple flame, providing a practical and reliable means of distinguishing it from other inorganic salts, thus enabling alchemists to evaluate and compare purification techniques; the earliest Latin accounts of saltpeter purification are dated after 1200. The first reference to the incendiary properties of such mixtures is the passage of the Zhenyuan miaodao yaolüe, a Taoist text tentatively dated to the mid-9th century: "Some have heated together sulfur, realgar and saltpeter with honey; smoke and flames result, so that their hands and faces have been burnt, and even the whole house where they were working burned down." The Chinese word for "gunpowder" is Chinese: 火药/火藥; pinyin: huŏ yào /xuo yɑʊ/, which literally means "Fire Medicine"; however this name only came into use some centuries after the mixture's discovery. In the following centuries a variety of gunpowder weapons such as rockets, bombs, and land mines appeared before the first metal barrel firearms were invented. Explosive weapons such as bombs have been discovered in a shipwreck off the shore of Japan dated from 1281, during the Mongol invasions of Japan. The Chinese Wujing Zongyao (Complete Essentials from the Military Classics), written by Zeng Gongliang between 1040 and 1044, provides encyclopedia references to a variety of mixtures that included petrochemicals—as well as garlic and honey. A slow match for flame throwing mechanisms using the siphon principle and for fireworks and rockets is mentioned. The mixture formulas in this book do not contain enough saltpeter to create an explosive however; being limited to at most 50% saltpeter, they produce an incendiary. The Essentials was however written by a Song dynasty court bureaucrat, and there is little evidence that it had any immediate impact on warfare; there is no mention of gunpowder use in the chronicles of the wars against the Tanguts in the 11th century, and China was otherwise mostly at peace during this century. However, by 1083 the Song court was producing hundreds of thousands of fire arrows for their garrisons. 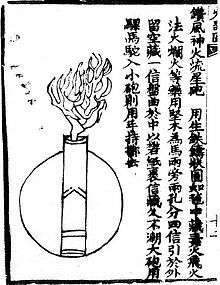 Bombs and the first proto-guns, known as "fire lances", became prominent during the 12th century and were used by the Song during the Jin-Song Wars. Fire lances were first recorded to have been used at the Siege of De'an in 1132 by Song forces against the Jin. In the early 13th century the Jin utilized iron-casing bombs. Projectiles were added to fire lances, re-usable fire lance barrels were developed, first out of hardened paper, and then metal. By 1257 some fire lances were firing wads of bullets. In the late 13th century metal fire lances became 'eruptors', proto-cannons firing co-viative projectiles, and by 1287 at the latest, had become true guns, the hand cannon. An arrow strapped with gunpowder ready to be shot from a bow. From the Huolongjing c. 1350. The oldest known depiction of rocket arrows, from the Huolongjing. The right arrow reads "fire arrow", the middle is an "arrow frame in the shape of a dragon", and the left is a "complete fire arrow". An illustration of a thunderclap bomb as depicted in the 1044 text Wujing Zongyao. Considered to be a pseudo-explosive. The top item is a through awl and the bottom one is a hook awl. A fire lance as depicted in the Huolongjing c. 1350. The "flying-cloud thunderclap-eruptor" cannon from the Huolongjing c. 1350. An organ gun known as the "mother of a hundred bullets gun" from the Huolongjing c. 1350. An illustration of a bronze "thousand ball thunder cannon" from the Huolongjing c. 1350. The "self-tripped trespass land mine" from the Huolongjing c. 1350. A picture of a 15th-century Granadian cannon from the book Al-izz wal rifa'a. The Muslims acquired knowledge of gunpowder some time between 1240 and 1280, by which point the Syrian Hasan al-Rammah had written, in Arabic, recipes for gunpowder, instructions for the purification of saltpeter, and descriptions of gunpowder incendiaries. It is implied by al-Rammah's usage of "terms that suggested he derived his knowledge from Chinese sources" and his references to saltpeter as "Chinese snow" (Arabic: ثلج الصين‎ thalj al-ṣīn), fireworks as "Chinese flowers" and rockets as "Chinese arrows" that knowledge of gunpowder arrived from China. However, because al-Rammah attributes his material to "his father and forefathers", al-Hassan argues that gunpowder became prevalent in Syria and Egypt by "the end of the twelfth century or the beginning of the thirteenth". In Persia saltpeter was known as "Chinese salt" (Persian: نمک چینی‎) namak-i chīnī) or "salt from Chinese salt marshes" (نمک شوره چینی namak-i shūra-yi chīnī). Hasan al-Rammah included 107 gunpowder recipes in his text al-Furusiyyah wa al-Manasib al-Harbiyya (The Book of Military Horsemanship and Ingenious War Devices), 22 of which are for rockets. If one takes the median of 17 of these 22 compositions for rockets (75% nitrates, 9.06% sulfur, and 15.94% charcoal), it is nearly identical to the modern reported ideal gunpowder recipe of 75% potassium nitrate, 10% sulfur, and 15% charcoal. Al-Hassan claims that in the Battle of Ain Jalut of 1260, the Mamluks used against the Mongols in "the first cannon in history" gunpowder formula with near-identical ideal composition ratios for explosive gunpowder. Other historians urge caution regarding claims of Islamic firearms use in the 1204–1324 period as late medieval Arabic texts used the same word for gunpowder, naft, that they used for an earlier incendiary, naphtha. Khan claims that it was invading Mongols who introduced gunpowder to the Islamic world and cites Mamluk antagonism towards early musketeers in their infantry as an example of how gunpowder weapons were not always met with open acceptance in the Middle East. Similarly, the refusal of their Qizilbash forces to use firearms contributed to the Safavid rout at Chaldiran in 1514. The arquebus first appeared in the Ottoman Empire at some point between 1394 and the early 15th century. The arquebus was later used in substantial numbers by the Janissaries of the Ottoman army by the mid-15th century. The matchlock arquebus was first used by the Janissary corps of the Ottoman army in the first half of the 15th century, possibly as early as 1394 but certainly by the 1440s. The musket first appeared in the Ottoman Empire by 1465. In 1598, Chinese writer Zhao Shizhen described Turkish muskets as being superior to European muskets. The Chinese military book Wu Pei Chih (1621) later described Turkish muskets that used a rack-and-pinion mechanism, which was not known to have been used in European or Chinese firearms at the time. The state-controlled manufacture of gunpowder by the Ottoman Empire through early supply chains to obtain nitre, sulfur and high-quality charcoal from oaks in Anatolia contributed significantly to its expansion between the 15th and 18th century. It was not until later in the 19th century when the syndicalist production of Turkish gunpowder was greatly reduced, which coincided with the decline of its military might. Earliest depiction of a European cannon, "De Nobilitatibus Sapientii Et Prudentiis Regum", Walter de Milemete, 1326. The earliest Western accounts of gunpowder appear in texts written by English philosopher Roger Bacon in the 13th century. Several sources mention Chinese firearms and gunpowder weapons being deployed by the Mongols against European forces at the Battle of Mohi in 1241. Professor Kenneth Warren Chase credits the Mongols for introducing into Europe gunpowder and its associated weaponry. However, there is no clear route of transmission, and while the Mongols are often pointed to as the likeliest vector, Timothy May points out that "there is no concrete evidence that the Mongols used gunpowder weapons on a regular basis outside of China." However, Timothy May also points out "However... the Mongols used the gunpowder weapon in their wars against the Jin, the Song and in their invasions of Japan." In Europe, one of the first mentions of gunpowder use appears in a passage found in Roger Bacon's Opus Maius of 1267 and Opus Tertium in what has been interpreted as being firecrackers. The most telling passage reads: "We have an example of these things (that act on the senses) in [the sound and fire of] that children's toy which is made in many [diverse] parts of the world; i.e., a device no bigger than one's thumb. From the violence of that salt called saltpeter [together with sulfur and willow charcoal, combined into a powder] so horrible a sound is made by the bursting of a thing so small, no more than a bit of parchment [containing it], that we find [the ear assaulted by a noise] exceeding the roar of strong thunder, and a flash brighter than the most brilliant lightning." In the early 20th century, British artillery officer Henry William Lovett Hime proposed that another work tentatively attributed to Bacon, Epistola de Secretis Operibus Artis et Naturae, et de Nullitate Magiae contained an encrypted formula for gunpowder. This claim has been disputed by historians of science including Lynn Thorndike, John Maxson Stillman and George Sarton and by Bacon's editor Robert Steele, both in terms of authenticity of the work, and with respect to the decryption method. In any case, the formula claimed to have been decrypted (7:5:5 saltpeter:charcoal:sulfur) is not useful for firearms use or even firecrackers, burning slowly and producing mostly smoke. However, if Bacon's recipe is taken as measurements by volume rather than weight, a far more potent and serviceable explosive powder is created suitable for firing hand-cannons, albeit less consistent due to the inherent inaccuracies of measurements by volume. One example of this composition resulted in 100 parts saltpeter, 27 parts charcoal, and 45 parts sulfur, by weight. The Liber Ignium, or Book of Fires, attributed to Marcus Graecus, is a collection of incendiary recipes, including some gunpowder recipes. Partington dates the gunpowder recipes to approximately 1300. One recipe for "flying fire" (ignis volatilis) involves saltpeter, sulfur, and colophonium, which, when inserted into a reed or hollow wood, "flies away suddenly and burns up everything." Another recipe, for artificial "thunder", specifies a mixture of one pound native sulfur, two pounds linden or willow charcoal, and six pounds of saltpeter. Another specifies a 1:3:9 ratio. Some of the gunpowder recipes of De Mirabilibus Mundi of Albertus Magnus are identical to the recipes of the Liber Ignium, and according to Partington, "may have been taken from that work, rather than conversely." Partington suggests that some of the book may have been compiled by Albert's students, "but since it is found in thirteenth century manuscripts, it may well be by Albert." Albertus Magnus died in 1280. A major advance in manufacturing began in Europe in the late 14th century when the safety and thoroughness of incorporation was improved by wet grinding; liquid, such as distilled spirits was added during the grinding-together of the ingredients and the moist paste dried afterwards. The principle of wet mixing to prevent the separation of dry ingredients, invented for gunpowder, is used today in the pharmaceutical industry. It was also discovered that if the paste was rolled into balls before drying the resulting gunpowder absorbed less water from the air during storage and traveled better. The balls were then crushed in a mortar by the gunner immediately before use, with the old problem of uneven particle size and packing causing unpredictable results. If the right size particles were chosen, however, the result was a great improvement in power. Forming the damp paste into corn-sized clumps by hand or with the use of a sieve instead of larger balls produced a product after drying that loaded much better, as each tiny piece provided its own surrounding air space that allowed much more rapid combustion than a fine powder. This "corned" gunpowder was from 30% to 300% more powerful. An example is cited where 34 pounds of serpentine was needed to shoot a 47-pound ball, but only 18 pounds of corned powder. The optimum size of the grain depended on its use; larger for large cannon, finer for small arms. Larger cast cannons were easily muzzle-loaded with corned powder using a long-handled ladle. Corned powder also retained the advantage of low moisture absorption, as even tiny grains still had much less surface area to attract water than a floury powder. During this time, European manufacturers also began regularly purifying saltpeter, using wood ashes containing potassium carbonate to precipitate calcium from their dung liquor, and using ox blood, alum, and slices of turnip to clarify the solution. During the Renaissance, two European schools of pyrotechnic thought emerged, one in Italy and the other at Nuremberg, Germany. The German printer and publisher Christiaan Egenolff adapted an earlier work on pyrotechnics from manuscript to print form, publishing his Büchsenmeysterei in 1529 and reprinting it in 1531. Now extremely rare, the book discusses the manufacturing of gunpowder, the operation of artillery and the rules of conduct for the gunsmith. In Italy, Vannoccio Biringuccio, born in 1480, was a member of the guild Fraternita di Santa Barbara but broke with the tradition of secrecy by setting down everything he knew in a book titled De la pirotechnia, written in vernacular. It was published posthumously in 1540, with 9 editions over 138 years, and also reprinted by MIT Press in 1966. By the mid-17th century fireworks were used for entertainment on an unprecedented scale in Europe, being popular even at resorts and public gardens. With the publication of Deutliche Anweisung zur Feuerwerkerey (1748), methods for creating fireworks were sufficiently well-known and well-described that "Firework making has become an exact science." In 1774 Louis XVI ascended to the throne of France at age 20. After he discovered that France was not self-sufficient in gunpowder, a Gunpowder Administration was established; to head it, the lawyer Antoine Lavoisier was appointed. Although from a bourgeois family, after his degree in law Lavoisier became wealthy from a company set up to collect taxes for the Crown; this allowed him to pursue experimental natural science as a hobby. Without access to cheap saltpeter (controlled by the British), for hundreds of years France had relied on saltpetermen with royal warrants, the droit de fouille or "right to dig", to seize nitrous-containing soil and demolish walls of barnyards, without compensation to the owners. This caused farmers, the wealthy, or entire villages to bribe the petermen and the associated bureaucracy to leave their buildings alone and the saltpeter uncollected. Lavoisier instituted a crash program to increase saltpeter production, revised (and later eliminated) the droit de fouille, researched best refining and powder manufacturing methods, instituted management and record-keeping, and established pricing that encouraged private investment in works. Although saltpeter from new Prussian-style putrefaction works had not been produced yet (the process taking about 18 months), in only a year France had gunpowder to export. A chief beneficiary of this surplus was the American Revolution. By careful testing and adjusting the proportions and grinding time, powder from mills such as at Essonne outside Paris became the best in the world by 1788, and inexpensive. Gunpowder production in Britain appears to have started in the mid 14th century with the aim of supplying the English Crown. Records show that, in England, gunpowder was being made in 1346 at the Tower of London; a powder house existed at the Tower in 1461; and in 1515 three King's gunpowder makers worked there. Gunpowder was also being made or stored at other Royal castles, such as Portchester. By the early 14th century, according to N.J.G. Pounds's study The Medieval Castle in England and Wales, many English castles had been deserted and others were crumbling. Their military significance faded except on the borders. Gunpowder had made smaller castles useless. Henry VIII of England was short of gunpowder when he invaded France in 1544 and England needed to import gunpowder via the port of Antwerp in what is now Belgium. The English Civil War (1642–1645) led to an expansion of the gunpowder industry, with the repeal of the Royal Patent in August 1641. One of the most notable uses of gunpowder in Great Britain was the Gunpowder Plot of 1605: a failed assassination attempt on King James I and VI. The plot was foiled when Guy Fawkes was found under the House of Lords with hidden barrels of gunpowder. All assailants who had a role in the plot escaped but were eventually caught. King James later decreed that November 5 become a day of celebration, which is a tradition that carries on today known as Bonfire Night. The introduction of smokeless powder in the late 19th century led to a contraction of the gunpowder industry. After the end of World War I, the majority of the United Kingdom gunpowder manufacturers merged into a single company, "Explosives Trades limited"; and a number of sites were closed down, including those in Ireland. This company became Nobel Industries Limited; and in 1926 became a founding member of Imperial Chemical Industries. The Home Office removed gunpowder from its list of Permitted Explosives; and shortly afterwards, on 31 December 1931, the former Curtis & Harvey's Glynneath gunpowder factory at Pontneddfechan, in Wales, closed down, and it was demolished by fire in 1932. The last remaining gunpowder mill at the Royal Gunpowder Factory, Waltham Abbey was damaged by a German parachute mine in 1941 and it never reopened. This was followed by the closure of the gunpowder section at the Royal Ordnance Factory, ROF Chorley, the section was closed and demolished at the end of World War II; and ICI Nobel's Roslin gunpowder factory, which closed in 1954. This left the sole United Kingdom gunpowder factory at ICI Nobel's Ardeer site in Scotland; it too closed in October 1976. Since then gunpowder has been imported into the United Kingdom. In the late 1970s/early 1980s gunpowder was bought from eastern Europe, particularly from what was then the German Democratic Republic and former Yugoslavia. In the year 1780 the British began to annex the territories of the Sultanate of Mysore, during the Second Anglo-Mysore War. The British battalion was defeated during the Battle of Guntur, by the forces of Hyder Ali, who effectively utilized Mysorean rockets and rocket artillery against the closely massed British forces. Gunpowder and gunpowder weapons were transmitted to India through the Mongol invasions of India. The Mongols were defeated by Alauddin Khalji of the Delhi Sultanate, and some of the Mongol soldiers remained in northern India after their conversion to Islam. It was written in the Tarikh-i Firishta (1606–1607) that Nasir ud din Mahmud the ruler of the Delhi Sultanate presented the envoy of the Mongol ruler Hulegu Khan with a dazzling pyrotechnics display upon his arrival in Delhi in 1258. Nasir ud din Mahmud tried to express his strength as a ruler and tried to ward off any Mongol attempt similar to the Siege of Baghdad (1258). Firearms known as top-o-tufak also existed in many Muslim kingdoms in India by as early as 1366. From then on the employment of gunpowder warfare in India was prevalent, with events such as the "Siege of Belgaum" in 1473 by Sultan Muhammad Shah Bahmani. The Mughal emperor Akbar mass-produced matchlocks for the Mughal Army. Akbar is personally known to have shot a leading Rajput commander during the Siege of Chittorgarh. The Mughals began to use bamboo rockets (mainly for signalling) and employ sappers: special units that undermined heavy stone fortifications to plant gunpowder charges. The Mughal Emperor Shah Jahan is known to have introduced much more advanced matchlocks, their designs were a combination of Ottoman and Mughal designs. Shah Jahan also countered the British and other Europeans in his province of Gujarāt, which supplied Europe saltpeter for use in gunpowder warfare during the 17th century. Bengal and Mālwa participated in saltpeter production. The Dutch, French, Portuguese, and English used Chhapra as a center of saltpeter refining. Ever since the founding of the Sultanate of Mysore by Hyder Ali, French military officers were employed to train the Mysore Army. Hyder Ali and his son Tipu Sultan were the first to introduce modern cannons and muskets, their army was also the first in India to have official uniforms. 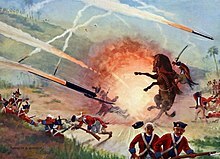 During the Second Anglo-Mysore War Hyder Ali and his son Tipu Sultan unleashed the Mysorean rockets at their British opponents effectively defeating them on various occasions. The Mysorean rockets inspired the development of the Congreve rocket, which the British widely utilized during the Napoleonic Wars and the War of 1812. The Javanese Majapahit Empire was arguably able to encompass much of modern-day Indonesia due to its unique mastery of bronze-smithing and use of a central arsenal fed by a large number of cottage industries within the immediate region. Documentary and archeological evidence indicate that Arab traders introduced gunpowder, gonnes, muskets, blunderbusses, and cannons to the Javanese, Acehnese, and Batak via long established commercial trade routes around the early to mid 14th century. Portuguese and Spanish invaders were unpleasantly surprised and even outgunned on occasion. The resurgent Singhasari Empire overtook Sriwijaya and later emerged as the Majapahit whose warfare featured the use of fire-arms and cannonade. c. 1540, the Javanese, always alert for new weapons found the newly arrived Portuguese weaponry superior to that of the locally made variants. Javanese bronze breech-loaded swivel-guns, known as meriam, or erroneously as lantaka, was used widely by the Majapahit navy as well as by pirates and rival lords. The demise of the Majapahit empire and the dispersal of disaffected skilled bronze cannon-smiths to Brunei, modern Sumatra, Malaysia and the Philippines lead to widespread use, especially in the Makassar Strait. Saltpeter harvesting was recorded by Dutch and German travelers as being common in even the smallest villages and was collected from the decomposition process of large dung hills specifically piled for the purpose. The Dutch punishment for possession of non-permitted gunpowder appears to have been amputation. Ownership and manufacture of gunpowder was later prohibited by the colonial Dutch occupiers. According to a colonel McKenzie quoted in Sir Thomas Stamford Raffles, The History of Java (1817), the purest sulfur was supplied from a crater from a mountain near the straits of Bali. On the origins of gunpowder technology, historian Tonio Andrade remarked, "Scholars today overwhelmingly concur that the gun was invented in China." Gunpowder and the gun are widely believed by historians to have originated from China because there is a large body of evidence that documents the evolution of the gun from the Chinese fire lance to a metal gun and the evolution of gunpowder from a medicine to an incendiary and an explosive, whereas similar records do not exist in Europe. As Andrade explains, the large amount of variation in gunpowder recipes in China relative to Europe is "evidence of experimentation in China, where gunpowder was at first used as an incendiary and only later became an explosive and a propellant... in contrast, formulas in Europe diverged only very slightly from the ideal proportions for use as an explosive and a propellant, suggesting that gunpowder was introduced as a mature technology." However, the history of gunpowder is not without controversy. A major problem confronting the study of early gunpowder history is ready access to sources close to the events described. Often the first records potentially describing use of gunpowder in warfare were written several centuries after the fact, and may well have been colored by the contemporary experiences of the chronicler. Translation difficulties have led to errors or loose interpretations bordering on artistic licence. Ambiguous language can make it difficult to distinguish gunpowder weapons from similar technologies that do not rely on gunpowder. A commonly cited example is a report of the Battle of Mohi in Eastern Europe that mentions a "long lance" sending forth "evil-smelling vapors and smoke", which has been variously interpreted by different historians as the "first-gas attack upon European soil" using gunpowder, "the first use of cannon in Europe", or merely a "toxic gas" with no evidence of gunpowder. It is difficult to accurately translate original Chinese alchemical texts, which tend to explain phenomena through metaphor, into modern scientific language with rigidly defined terminology in English. Early texts potentially mentioning gunpowder are sometimes marked by a linguistic process where semantic change occurred. For instance, the Arabic word naft transitioned from denoting naphtha to denoting gunpowder, and the Chinese word pào changed in meaning from catapult to referring to a cannon. This has led to arguments on the exact origins of gunpowder based on etymological foundations. Science and technology historian Bert S. Hall makes the observation that, "It goes without saying, however, that historians bent on special pleading, or simply with axes of their own to grind, can find rich material in these terminological thickets." Another major area of contention in modern studies of the history of gunpowder is regarding the transmission of gunpowder. While the literary and archaeological evidence supports a Chinese origin for gunpowder and guns, the manner in which gunpowder technology was transferred from China to the West is still under debate. It is unknown why the rapid spread of gunpowder technology across Eurasia took place over several decades whereas other technologies such as paper, the compass, and printing did not reach Europe until centuries after they were invented in China. 1840 drawing of a gunpowder magazine near Tehran, Persia. Gunpowder was extensively used in the Naderian Wars. For the most powerful black powder, meal powder, a wood charcoal, is used. The best wood for the purpose is Pacific willow, but others such as alder or buckthorn can be used. In Great Britain between the 15th and 19th centuries charcoal from alder buckthorn was greatly prized for gunpowder manufacture; cottonwood was used by the American Confederate States. The ingredients are reduced in particle size and mixed as intimately as possible. Originally, this was with a mortar-and-pestle or a similarly operating stamping-mill, using copper, bronze or other non-sparking materials, until supplanted by the rotating ball mill principle with non-sparking bronze or lead. Historically, a marble or limestone edge runner mill, running on a limestone bed, was used in Great Britain; however, by the mid 19th century this had changed to either an iron-shod stone wheel or a cast iron wheel running on an iron bed. The mix was dampened with alcohol or water during grinding to prevent accidental ignition. This also helps the extremely soluble saltpeter to mix into the microscopic nooks and crannies of the very high surface-area charcoal. Around the late 14th century, European powdermakers first began adding liquid during grinding to improve mixing, reduce dust, and with it the risk of explosion. The powder-makers would then shape the resulting paste of dampened gunpowder, known as mill cake, into corns, or grains, to dry. Not only did corned powder keep better because of its reduced surface area, gunners also found that it was more powerful and easier to load into guns. Before long, powder-makers standardized the process by forcing mill cake through sieves instead of corning powder by hand. Another advance was the manufacture of kiln charcoal by distilling wood in heated iron retorts instead of burning it in earthen pits. Controlling the temperature influenced the power and consistency of the finished gunpowder. In 1863, in response to high prices for Indian saltpeter, DuPont chemists developed a process using potash or mined potassium chloride to convert plentiful Chilean sodium nitrate to potassium nitrate. The following year (1864) the Gatebeck Low Gunpowder Works in Cumbria (Great Britain) started a plant to manufacture potassium nitrate by essentially the same chemical process. This is nowadays called the ‘Wakefield Process’, after the owners of the company. It would have used potassium chloride from the Staßfurt mines, near Magdeburg, Germany, which had recently become available in industrial quantities. During the 18th century, gunpowder factories became increasingly dependent on mechanical energy. Despite mechanization, production difficulties related to humidity control, especially during the pressing, were still present in the late 19th century. A paper from 1885 laments that "Gunpowder is such a nervous and sensitive spirit, that in almost every process of manufacture it changes under our hands as the weather changes." Pressing times to the desired density could vary by a factor of three depending on the atmospheric humidity. The term black powder was coined in the late 19th century, primarily in the United States, to distinguish prior gunpowder formulations from the new smokeless powders and semi-smokeless powders. Semi-smokeless powders featured bulk volume properties that approximated black powder, but had significantly reduced amounts of smoke and combustion products. Smokeless powder has different burning properties (pressure vs. time) and can generate higher pressures and work per gram. This can rupture older weapons designed for black powder. Smokeless powders ranged in color from brownish tan to yellow to white. Most of the bulk semi-smokeless powders ceased to be manufactured in the 1920s. Charcoal does not consist of pure carbon; rather, it consists of partially pyrolyzed cellulose, in which the wood is not completely decomposed. Carbon differs from ordinary charcoal. Whereas charcoal's autoignition temperature is relatively low, carbon's is much greater. Thus, a black powder composition containing pure carbon would burn similarly to a match head, at best. The current standard composition for the black powders that are manufactured by pyrotechnicians was adopted as long ago as 1780. Proportions by weight are 75% potassium nitrate (known as saltpeter or saltpetre), 15% softwood charcoal, and 10% sulfur. These ratios have varied over the centuries and by country, and can be altered somewhat depending on the purpose of the powder. For instance, power grades of black powder, unsuitable for use in firearms but adequate for blasting rock in quarrying operations, are called blasting powder rather than gunpowder with standard proportions of 70% nitrate, 14% charcoal, and 16% sulfur; blasting powder may be made with the cheaper sodium nitrate substituted for potassium nitrate and proportions may be as low as 40% nitrate, 30% charcoal, and 30% sulfur. In 1857, Lammot du Pont solved the main problem of using cheaper sodium nitrate formulations when he patented DuPont "B" blasting powder. After manufacturing grains from press-cake in the usual way, his process tumbled the powder with graphite dust for 12 hours. This formed a graphite coating on each grain that reduced its ability to absorb moisture. Neither the use of graphite nor sodium nitrate was new. Glossing gunpowder corns with graphite was already an accepted technique in 1839, and sodium nitrate-based blasting powder had been made in Peru for many years using the sodium nitrate mined at Tarapacá (now in Chile). Also, in 1846, two plants were built in south-west England to make blasting powder using this sodium nitrate. The idea may well have been brought from Peru by Cornish miners returning home after completing their contracts. Another suggestion is that it was William Lobb, the planthunter, who recognised the possibilities of sodium nitrate during his travels in South America. Lammot du Pont would have known about the use of graphite and probably also knew about the plants in south-west England. In his patent he was careful to state that his claim was for the combination of graphite with sodium nitrate-based powder, rather than for either of the two individual technologies. French war powder in 1879 used the ratio 75% saltpeter, 12.5% charcoal, 12.5% sulfur. English war powder in 1879 used the ratio 75% saltpeter, 15% charcoal, 10% sulfur. The British Congreve rockets used 62.4% saltpeter, 23.2% charcoal and 14.4% sulfur, but the British Mark VII gunpowder was changed to 65% saltpeter, 20% charcoal and 15% sulfur. The explanation for the wide variety in formulation relates to usage. Powder used for rocketry can use a slower burn rate since it accelerates the projectile for a much longer time—whereas powders for weapons such as flintlocks, cap-locks, or matchlocks need a higher burn rate to accelerate the projectile in a much shorter distance. Cannons usually used lower burn rate powders, because most would burst with higher burn rate powders. The original dry-compounded powder used in 15th-century Europe was known as "Serpentine", either a reference to Satan or to a common artillery piece that used it. The ingredients were ground together with a mortar and pestle, perhaps for 24 hours, resulting in a fine flour. Vibration during transportation could cause the components to separate again, requiring remixing in the field. Also if the quality of the saltpeter was low (for instance if it was contaminated with highly hygroscopic calcium nitrate), or if the powder was simply old (due to the mildly hygroscopic nature of potassium nitrate), in humid weather it would need to be re-dried. The dust from "repairing" powder in the field was a major hazard. Loading cannons or bombards before the powder-making advances of the Renaissance was a skilled art. Fine powder loaded haphazardly or too tightly would burn incompletely or too slowly. Typically, the breech-loading powder chamber in the rear of the piece was filled only about half full, the serpentine powder neither too compressed nor too loose, a wooden bung pounded in to seal the chamber from the barrel when assembled, and the projectile placed on. A carefully determined empty space was necessary for the charge to burn effectively. When the cannon was fired through the touchhole, turbulence from the initial surface combustion caused the rest of the powder to be rapidly exposed to the flame. The advent of much more powerful and easy to use corned powder changed this procedure, but serpentine was used with older guns into the 17th century. For propellants to oxidize and burn rapidly and effectively, the combustible ingredients must be reduced to the smallest possible particle sizes, and be as thoroughly mixed as possible. Once mixed, however, for better results in a gun, makers discovered that the final product should be in the form of individual dense grains that spread the fire quickly from grain to grain, much as straw or twigs catch fire more quickly than a pile of sawdust. Because the dry powdered ingredients must be mixed and bonded together for extrusion and cutting into grains to maintain the blend, size reduction and mixing is done while the ingredients are damp, usually with water. After 1800, instead of forming grains by hand or with sieves, the damp mill-cake was pressed in molds to increase its density and extract the liquid, forming press-cake. The pressing took varying amounts of time, depending on conditions such as atmospheric humidity. The hard, dense product was broken again into tiny pieces, which were separated with sieves to produce a uniform product for each purpose: coarse powders for cannons, finer grained powders for muskets, and the finest for small hand guns and priming. Inappropriately fine-grained powder often caused cannons to burst before the projectile could move down the barrel, due to the high initial spike in pressure. Mammoth powder with large grains, made for Rodman's 15-inch cannon, reduced the pressure to only 20 percent as high as ordinary cannon powder would have produced. In the mid-19th century, measurements were made determining that the burning rate within a grain of black powder (or a tightly packed mass) is about 6 cm/s (0.20 feet/s), while the rate of ignition propagation from grain to grain is around 9 m/s (30 feet/s), over two orders of magnitude faster. Modern corning first compresses the fine black powder meal into blocks with a fixed density (1.7 g/cm³). In the United States, gunpowder grains were designated F (for fine) or C (for coarse). Grain diameter decreased with a larger number of Fs and increased with a larger number of Cs, ranging from about 2 mm (0.08 in) for 7F to 15 mm (0.6 in) for 7C. Even larger grains were produced for artillery bore diameters greater than about 17 cm (6.7 in). The standard DuPont Mammoth powder developed by Thomas Rodman and Lammot du Pont for use during the American Civil War had grains averaging 0.6 inches (15 mm) in diameter with edges rounded in a glazing barrel. Other versions had grains the size of golf and tennis balls for use in 20-inch (51 cm) Rodman guns. In 1875 DuPont introduced Hexagonal powder for large artillery, which was pressed using shaped plates with a small center core—about 1.5 inches (3.8 cm) diameter, like a wagon wheel nut, the center hole widened as the grain burned. By 1882 German makers also produced hexagonal grained powders of a similar size for artillery. By the late 19th century manufacturing focused on standard grades of black powder from Fg used in large bore rifles and shotguns, through FFg (medium and small-bore arms such as muskets and fusils), FFFg (small-bore rifles and pistols), and FFFFg (extreme small bore, short pistols and most commonly for priming flintlocks). A coarser grade for use in military artillery blanks was designated A-1. These grades were sorted on a system of screens with oversize retained on a mesh of 6 wires per inch, A-1 retained on 10 wires per inch, Fg retained on 14, FFg on 24, FFFg on 46, and FFFFg on 60. Fines designated FFFFFg were usually reprocessed to minimize explosive dust hazards. In the United Kingdom, the main service gunpowders were classified RFG (rifle grained fine) with diameter of one or two millimeters and RLG (rifle grained large) for grain diameters between two and six millimeters. Gunpowder grains can alternatively be categorized by mesh size: the BSS sieve mesh size, being the smallest mesh size, which retains no grains. Recognized grain sizes are Gunpowder G 7, G 20, G 40, and G 90. Besides black powder, there are other historically important types of gunpowder. "Brown gunpowder" is cited as composed of 79% nitre, 3% sulfur, and 18% charcoal per 100 of dry powder, with about 2% moisture. Prismatic Brown Powder is a large-grained product the Rottweil Company introduced in 1884 in Germany, which was adopted by the British Royal Navy shortly thereafter. The French navy adopted a fine, 3.1 millimeter, not prismatic grained product called Slow Burning Cocoa (SBC) or "cocoa powder". These brown powders reduced burning rate even further by using as little as 2 percent sulfur and using charcoal made from rye straw that had not been completely charred, hence the brown color. Lesmok powder was a product developed by DuPont in 1911, one of several semi-smokeless products in the industry containing a mixture of black and nitrocellulose powder. It was sold to Winchester and others primarily for .22 and .32 small calibers. Its advantage was that it was believed at the time to be less corrosive than smokeless powders then in use. It was not understood in the U.S. until the 1920s that the actual source of corrosion was the potassium chloride residue from potassium chlorate sensitized primers. The bulkier black powder fouling better disperses primer residue. Failure to mitigate primer corrosion by dispersion caused the false impression that nitrocellulose-based powder caused corrosion. Lesmok had some of the bulk of black powder for dispersing primer residue, but somewhat less total bulk than straight black powder, thus requiring less frequent bore cleaning. It was last sold by Winchester in 1947. The development of smokeless powders, such as cordite, in the late 19th century created the need for a spark-sensitive priming charge, such as gunpowder. However, the sulfur content of traditional gunpowders caused corrosion problems with Cordite Mk I and this led to the introduction of a range of sulfur-free gunpowders, of varying grain sizes. They typically contain 70.5 parts of saltpeter and 29.5 parts of charcoal. Like black powder, they were produced in different grain sizes. In the United Kingdom, the finest grain was known as sulfur-free mealed powder (SMP). Coarser grains were numbered as sulfur-free gunpowder (SFG n): 'SFG 12', 'SFG 20', 'SFG 40' and 'SFG 90', for example; where the number represents the smallest BSS sieve mesh size, which retained no grains. Gunpowder does not burn as a single reaction, so the byproducts are not easily predicted. One study showed that it produced (in order of descending quantities) 55.91% solid products: potassium carbonate, potassium sulfate, potassium sulfide, sulfur, potassium nitrate, potassium thiocyanate, carbon, ammonium carbonate and 42.98% gaseous products: carbon dioxide, nitrogen, carbon monoxide, hydrogen sulfide, hydrogen, methane, 1.11% water. However, simplified equations have been cited. Black powder made with less-expensive and more plentiful sodium nitrate (in appropriate proportions) works just as well, and previous equations apply, with sodium instead of potassium. However, it is more hygroscopic than powders made from potassium nitrate—popularly known as saltpeter. Because corned black powder grains made with saltpeter are less affected by moisture in the air, they can be stored unsealed without degradation by humidity. Muzzleloaders have been known to fire after hanging on a wall for decades in a loaded state, provided they remained dry. By contrast, black powder made with sodium nitrate must be kept sealed to remain stable. The matchlock musket or pistol (an early gun ignition system), as well as the flintlock would often be unusable in wet weather, due to powder in the pan being exposed and dampened. Gunpowder releases 3 megajoules per kilogram and contains its own oxidant. This is lower than TNT (4.7 megajoules per kilogram), or gasoline (47.2 megajoules per kilogram, but gasoline requires an oxidant, so an optimized gasoline and O2 mixture contains 10.4 megajoules per kilogram). Black powder also has a low energy density compared to modern "smokeless" powders, and thus to achieve high energy loadings, large amounts of black powder are needed with heavy projectiles. Gunpowder is a low explosive, that is, it does not detonate but rather deflagrates (burns quickly). This is an advantage in a propeller device, where one does not desire a shock that would shatter the gun and potentially harm the operator, however it is a drawback when some explosion is wanted. In that case, gunpowder (and most importantly, gases produced by its burning) must be confined. Since it contains its own oxidizer and additionally burns faster under pressure, its combustion is capable of bursting containers such as shell, grenade, or improvised "pipe bomb" or "pressure cooker" casings to form shrapnel. As seen above, combustion converts less than half the mass of black powder to gas, most of it turns into particulate matter. Some of it is ejected, wasting propelling power, fouling the air, and generally being a nuisance (giving away a soldier's position, generating fog that hinders vision, etc.). Some of it ends up as a thick layer of soot inside the barrel, where it also is a nuisance for subsequent shots, and a cause of jamming an automatic weapon. Moreover, this residue is hygroscopic, and with the addition of moisture absorbed from the air forms a corrosive substance. The soot contains potassium oxide or sodium oxide that turns into potassium hydroxide, or sodium hydroxide, which corrodes wrought iron or steel gun barrels. Black powder arms must therefore be well cleaned after use, both inside and out, to remove the residue. The United Nations Model Regulations on the Transportation of Dangerous Goods and national transportation authorities, such as United States Department of Transportation, have classified gunpowder (black powder) as a Group A: Primary explosive substance for shipment because it ignites so easily. Complete manufactured devices containing black powder are usually classified as Group D: Secondary detonating substance, or black powder, or article containing secondary detonating substance, such as firework, class D model rocket engine, etc., for shipment because they are harder to ignite than loose powder. As explosives, they all fall into the category of Class 1. Besides its use as a propellant in firearms and artillery, black powder's other main use has been as a blasting powder in quarrying, mining, and road construction (including railroad construction). During the 19th century, outside of war emergencies such as the Crimean War or the American Civil War, more black powder was used in these industrial uses than in firearms and artillery. But dynamite gradually replaced it for those uses. Today industrial explosives for such uses are still a huge market, but most of the market is in newer explosives rather than black powder. Beginning in the 1930s, gunpowder or smokeless powder was used in rivet guns, stun guns for animals, cable splicers and other industrial construction tools. The "stud gun" drove nails or screws into solid concrete, a function not possible with hydraulic tools. Today powder-actuated tools are still an important part of various industries, but the cartridges usually use smokeless powders. Industrial shotguns have been used to eliminate persistent material rings in operating rotary kilns (such as those for cement, lime, phosphate, etc.) and clinker in operating furnaces, and commercial tools make the method more reliable. After the Battle of Aspern-Essling (1809), the surgeon of the Napoleonic Army Larrey, lacking salt, seasoned a horse meat bouillon for the wounded under his care with gunpowder. It was also used for sterilization in ships when there was no alcohol. British sailors used gunpowder to create tattoos when ink wasn't available, by pricking the skin and rubbing the powder into the wound in a method known as traumatic tattooing. Near London in 1853, Captain Shrapnel demonstrated a mineral processing use of black powder in a method for crushing gold-bearing ores by firing them from a cannon into an iron chamber, and "much satisfaction was expressed by all present". He hoped it would be useful on the goldfields of California and Australia. Nothing came of the invention, as continuously-operating crushing machines that achieved more reliable comminution were already coming into use. ^ Agrawal 2010, p. 69. ^ a b Buchanan 2006, p. 2. ^ a b c Andrade 2016, p. 30. ^ Hazel Rossotti (2002). Fire: Servant, Scourge, and Enigma. Courier Dover Publications. pp. 132–37. ISBN 978-0-486-42261-9. ^ "Explosives – History". science.jrank.org. Retrieved 2 February 2017. ^ Chase 2003, pp. 31–32; Andrade 2016, p. 30. ^ a b Andrade 2016, p. 42. ^ a b Chase 2003, p. 31. ^ Needham 1986, p. 103. ^ Chase 2003, pp. 31–32. ^ Kelly 2004, p. 4. ^ Lorge 2008, p. 18. ^ Chase 2003, p. 1. ^ Delgado, James (February 2003). "Relics of the Kamikaze". Archaeology. 56 (1). ^ Andrade 2016, p. 32. ^ Lorge 2008, pp. 33–34. ^ Andrade 2016, p. 51. ^ Partington 1960, p. 246. ^ Needham 1986, pp. 293–94. ^ a b Kelly 2004, p. 22. ^ a b c Hassan, Ahmad Y. "Transfer of Islamic Technology to the West: Part III". History of Science and Technology in Islam. ^ Watson 2006, p. 304. ^ a b Nolan 2006, p. 365. ^ Partington 1960, p. 335. ^ Needham 1980, p. 194. ^ a b Khan 2004, p. 6. ^ Ayalon, David (2013). Gunpowder and Firearms in the Mamluk Kingdom: A Challenge to Medieval Society (1956). Routledge. p. 126. ISBN 9781136277320. ^ Needham 1986, p. 444. ^ Needham 1986, p. 446. ^ Nelson, Cameron Rubaloff (2010-07). Manufacture and transportation of gunpowder in the Ottoman Empire: 1400–1800 M.A. Thesis. ^ William H. McNeill (1992). The Rise of the West: A History of the Human Community. University of Chicago Press. p. 492. ISBN 978-0-226-56141-7. Retrieved 29 July 2011. ^ Cowley 1993, p. 86. ^ a b c Andrade 2016, p. 76. ^ a b Needham 1986, pp. 48–50. ^ Needham 1986, p. 358. ^ Partington 1999, p. xxiv. ^ Bretscher, Ulrich. "The Recipe for Black Powder". Ulrich Bretscher's Black Powder Page. Retrieved 17 October 2017. ^ Partington 1960, p. 60. ^ Partington 1960, pp. 48–49, 54. ^ a b Partington 1960, pp. 82–83. ^ a b c d Kelly 2004, p. 61. ^ "Early printing, 15th and 16th century" (PDF). Asher Rare Books. Retrieved 4 May 2015. ^ Microsoft Encarta Online Encyclopedia 2007 Archived 31 October 2009. ^ Philip, Chris (1988). A bibliography of firework books: works on recreative fireworks from the sixteenth to the twentieth century. Dingmans Ferry, PA: American Fireworks News. ISBN 978-0-929931-00-5. ^ In 1777 Lavoisier named oxygen, which had earlier been isolated by Priestley; the realization that saltpeter contained this substance was fundamental to understanding gunpowder. ^ a b Kelly 2004, p. 164. ^ a b c d e f g h i Cocroft 2000. ^ MacDougall, Ian (2000). 'Oh, ye had to be careful' : personal recollections by Roslin gunpowder mill and bomb factory workers. East Linton, Scotland: Tuckwell Press in association with the European Ethnological Research Centre and the Scottish Working People's History Trust. ISBN 978-1-86232-126-7. ^ Iqtidar Alam Khan (2004). Gunpowder And Firearms: Warfare In Medieval India. Oxford University Press. ISBN 978-0-19-566526-0. ^ a b Iqtidar Alam Khan (25 April 2008). Historical Dictionary of Medieval India. Scarecrow Press. p. 157. ISBN 978-0-8108-5503-8. ^ Partington 1999, p. 225. ^ Partington 1999, p. 226. ^ a b c "India." Encyclopædia Britannica 2008 Ultimate Reference Suite. Chicago: Encyclopædia Britannica, 2008. ^ "rocket and missile system." Encyclopædia Britannica 2008 Ultimate Reference Suite. Chicago: Encyclopædia Britannica, 2008. ^ a b Dipanegara, P.B.R. Carey, Babad Dipanagara: an account of the outbreak of the Java war, 1825–30 : the Surakarta court version of the Babad Dipanagara with translations into English and Indonesian volume 9: Council of the M.B.R.A.S. by Art Printing Works: 1981. ^ Atsushi, Ota (2006). Changes of regime and social dynamics in West Java : society, state, and the outer world of Banten, 1750–1830. Leiden: Brill. ISBN 978-90-04-15091-1. ^ Raffles, Thomas Stamford (1978). The History of Java ([Repr.]. ed.). Kuala Lumpur: Oxford University Press. ISBN 978-0-19-580347-1. ^ Andrade 2016, pp. 75–76. ^ Ágoston 2008, p. 15. ^ Partington 1999, p. 198; Saunders 1971, p. 198. ^ a b Partington 1999, pp. xvi–xvii. ^ Purton 2010, pp. 108–09. ^ US Department of Agriculture (1917). Department Bulleting No. 316: Willows: Their growth, use, and importance. The Department. p. 31. ^ Kelly 2004, p. 200. ^ Kelly 2004, pp. 60–63. ^ Kelly 2004, p. 199. ^ Jecock, Marcus; Dunn, Christopher; et al. (2009). "Gatebeck Low Gunpowder Works and the Workers' Settlements of Endmoor and Gatebeck, Cumbria". Research Department Report Series. 63-2009. ISSN 1749-8775. ^ Heller, Cornelia (December 2009). "Stassfurt" (PDF). STASSFURT – FAD. Ministry of Regional Development and Transport Saxony-Anhalt. p. 10. Retrieved 27 May 2015. ^ Frängsmyr, Tore, J.L. Heilbron, and Robin E. Rider, editors The Quantifying Spirit in the Eighteenth Century. Berkeley: University of California Press, 1990. http://ark.cdlib.org/ark:/13030/ft6d5nb455/ p. 292. ^ Buchanan 2006, p. 4. ^ Kelly 2004, p. 218. ^ "Some Account of Gunpowder". The Saturday Magazine. 422, supplement: 33–40. January 1839. ^ Wisniak, J. J.; Garcés, I. (September 2001). "The Rise and Fall of the Salitre (Sodium Nitrate) Industry". Indian Journal of Chemical Technology: 427–438. ^ Ashford, Bob (2016). "A New Interpretation of the Historical Data on the Gunpowder Industry in Devon and Cornwall". J. Trevithick Soc. 43: 65–73. ^ a b c Kelly 2004, p. 58. ^ a b c John Francis Guilmartin (2003). Gunpowder & galleys: changing technology & Mediterranean warfare at sea in the 16th century. Conway Maritime Press. pp. 109–10, 298–300. ISBN 978-0-85177-951-5. ^ a b Kelly 2004, p. 195. ^ Tenney L. Davis (1943). The Chemistry of Powder and Explosives (PDF). p. 139. ^ a b c Kelly 2004, p. 224. ^ a b Rodney James (2011). The ABCs of Reloading: The Definitive Guide for Novice to Expert (9 ed.). Krause Publications. pp. 53–59. ISBN 978-1-4402-1396-0. ^ Wakeman, Randy. "Blackpowder to Pyrodex and Beyond". Retrieved 31 August 2014. ^ Julian S. Hatcher, Hatcher's Notebook, Stackpole Books, 1962. Chapter XIV, Gun Corrosion and Ammunition Developments, pp. 346–49. ^ Wakeman, Randy. "Blackpowder to Pyrodex and Beyond". ^ Corporation, Bonnier (April 1932). Popular Science. ^ "MasterBlaster System". Remington Products. Archived from the original on 4 October 2010. ^ Parker, Harold T. (1983). Three Napoleonic battles (Repr., Durham, 1944. ed.). Durham, NC: Duke Univ. Pr. p. 83. ISBN 978-0-8223-0547-7. ^ Larrey is quoted in French at Dr Béraud, Études Hygiéniques de la chair de cheval comme aliment, Musée des Familles (1841–42). ^ Rediker, Marcus (1989). Between the devil and the deep blue sea: merchant seamen, pirates, and the Anglo-American maritime world, 1700–1750 (1st pbk. ed.). Cambridge: Cambridge University Press. p. 12. ISBN 978-0-521-37983-0. Ágoston, Gábor (2008), Guns for the Sultan: Military Power and the Weapons Industry in the Ottoman Empire, Cambridge University Press, ISBN 978-0-521-60391-1 . Agrawal, Jai Prakash (2010), High Energy Materials: Propellants, Explosives and Pyrotechnics, Wiley-VCH . Arnold, Thomas (2001), The Renaissance at War, Cassell & Co, ISBN 978-0-304-35270-8 . Benton, Captain James G. (1862). A Course of Instruction in Ordnance and Gunnery (2 ed.). West Point, New York: Thomas Publications. ISBN 978-1-57747-079-3. .
Brown, G.I. (1998), The Big Bang: A History of Explosives, Sutton Publishing, ISBN 978-0-7509-1878-7 . Bretscher, Ulrich. "The Recipe for Black Powder". Ulrich Bretscher's Black Powder Page. Retrieved 17 October 2017. Bachrach, David Stewart (2006), Buchanan, Brenda J. (ed. ), "Gunpowder, Explosives and the State: A Technological History", Technology and Culture, Aldershot: Ashgate, 49 (3): 785–86, doi:10.1353/tech.0.0051, ISBN 978-0-7546-5259-5 . Cocroft, Wayne (2000), Dangerous Energy: The archaeology of gunpowder and military explosives manufacture, Swindon: English Heritage, ISBN 978-1-85074-718-5 . Cressy, David (2013), Saltpeter: The Mother of Gunpowder, Oxford University Press . Curtis, W.S. (2014), Long Range Shooting: A Historical Perspective, WeldenOwen . Easton, S.C. (1952), Roger Bacon and His Search for a Universal Science: A Reconsideration of the Life and Work of Roger Bacon in the Light of His Own Stated Purposes, Basil Blackwell . Ebrey, Patricia B. (1999), The Cambridge Illustrated History of China, Cambridge University Press, ISBN 978-0-521-43519-2 . Harding, Richard (1999), Seapower and Naval Warfare, 1650–1830, UCL Press Limited . Khan, Iqtidar Alam (2008), Historical Dictionary of Medieval India, The Scarecrow Press, Inc., ISBN 978-0-8108-5503-8 . Konstam, Angus (2002), Renaissance War Galley 1470–1590, Osprey Publisher Ltd.
Liang, Jieming (2006), Chinese Siege Warfare: Mechanical Artillery & Siege Weapons of Antiquity, Singapore: Leong Kit Meng, ISBN 978-981-05-5380-7 . Lidin, Olaf G. (2002), Tanegashima – The Arrival of Europe in Japan, Nordic Inst of Asian Studies, ISBN 978-87-91114-12-0 . Lorge, Peter A. (2008), The Asian Military Revolution: from Gunpowder to the Bomb, Cambridge University Press, ISBN 978-0-521-60954-8 . Lu, Gwei-Djen (1988), "The Oldest Representation of a Bombard", Technology and Culture, 29: 594–605 . Morillo, Stephen (2008), War in World History: Society, Technology, and War from Ancient Times to the Present, Volume 1, To 1500, McGraw-Hill, ISBN 978-0-07-052584-9 . Needham, Joseph (1980), Science & Civilisation in China, 5 pt. 4, Cambridge University Press, ISBN 978-0-521-08573-1 . Nolan, Cathal J. (2006), The Age of Wars of Religion, 1000–1650: an Encyclopedia of Global Warfare and Civilization, Vol 1, A-K, 1, Westport & London: Greenwood Press, ISBN 978-0-313-33733-8 . Partington, J.R. (1960), A History of Greek Fire and Gunpowder, Cambridge: W. Heffer & Sons . Partington, J.R. (1999), A History of Greek Fire and Gunpowder, Baltimore: Johns Hopkins University Press, ISBN 978-0-8018-5954-0 . Perrin, Noel (1979), "Giving up the Gun, Japan's reversion to the Sword, 1543–1879", The Yale Journal of Biology and Medicine, Boston: David R. Godine, 54 (2): 154–155, ISBN 978-0-87923-773-8, PMC 2595867 . Phillips, Henry Prataps (2016), The History and Chronology of Gunpowder and Gunpowder Weapons (c. 1000 to 1850), Notion Press . Purton, Peter (2010), A History of the Late Medieval Siege, 1200–1500, Boydell Press, ISBN 978-1-84383-449-6 . Rose, Susan (2002), Medieval Naval Warfare 1000–1500, Routledge . Roy, Kaushik (2015), Warfare in Pre-British India, Routledge . Schmidtchen, Volker (1977b), "Riesengeschütze des 15. Jahrhunderts. Technische Höchstleistungen ihrer Zeit", Technikgeschichte 44 (3): 213–37 (226–28). Saunders, J.J. (1971), The History of the Mongol Conquests, University of Pennsylvania Press, ISBN 978-0-8122-1766-7 . Turnbull, Stephen (2003), Fighting Ships Far East (2: Japan and Korea Ad 612–1639, Osprey Publishing, ISBN 978-1-84176-478-8 . Villalon, L.J. Andrew (2008), The Hundred Years War (part II): Different Vistas, Brill Academic Pub, ISBN 978-90-04-16821-3 . Wagner, John A. (2006), The Encyclopedia of the Hundred Years War, Westport & London: Greenwood Press, ISBN 978-0-313-32736-0 . Watson, Peter (2006), Ideas: A History of Thought and Invention, from Fire to Freud, Harper Perennial (2006), ISBN 978-0-06-093564-1 . Wikimedia Commons has media related to Gunpowder. "Ulrich Bretschler's Gunpowder Chemistry page". Archived from the original on 23 May 2012. ""Black Powder" search at DTIC". Archived from the original on 16 June 2013.